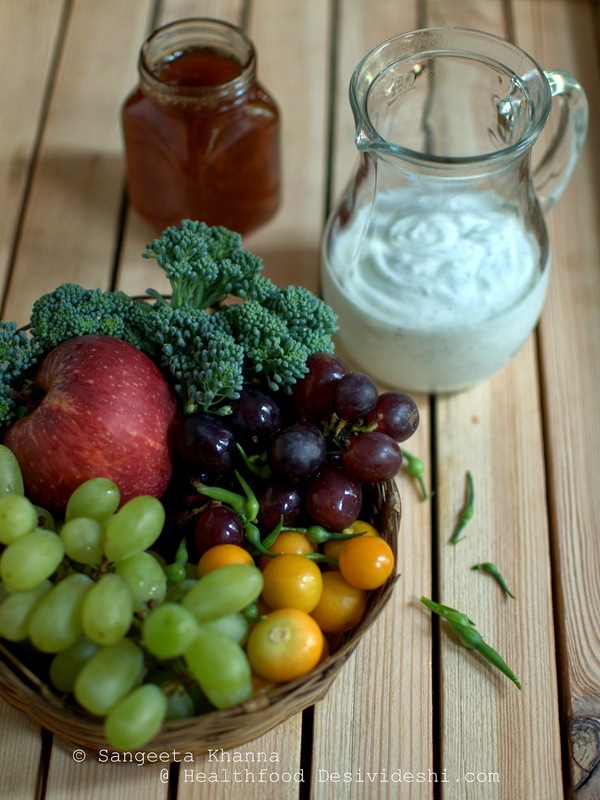 Yogurt dressing in salads is a great way to make the salads healthy, enhance citrus and fruity flavours, preserve the salad well for a few hours and supplement it with calcium and probiotic flora at the same time. 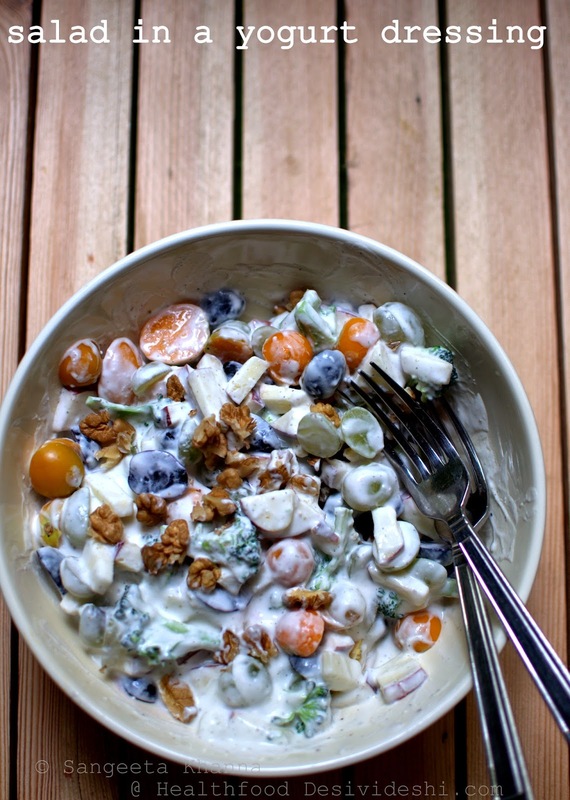 I have been having fruit and raw vegetables salads with yogurt dressing a lot these days. Life is different post winters though the warmth in the air is still pleasant. Spring brought a riot of colours to my garden and then the trees started shedding copious numbers of leaves with every blow of wind. The flower beds get flooded with dry leaves and that somehow feels unsettling in this weather. May be it's just me but this weather always brings mixed feelings. Even the food choices keep changing from warm to cold within a day sometimes. Some days I just want a cold comforting salad and that is how I assemble such meals with seasonal fruits and a few bits from the garden, freshly plucked. 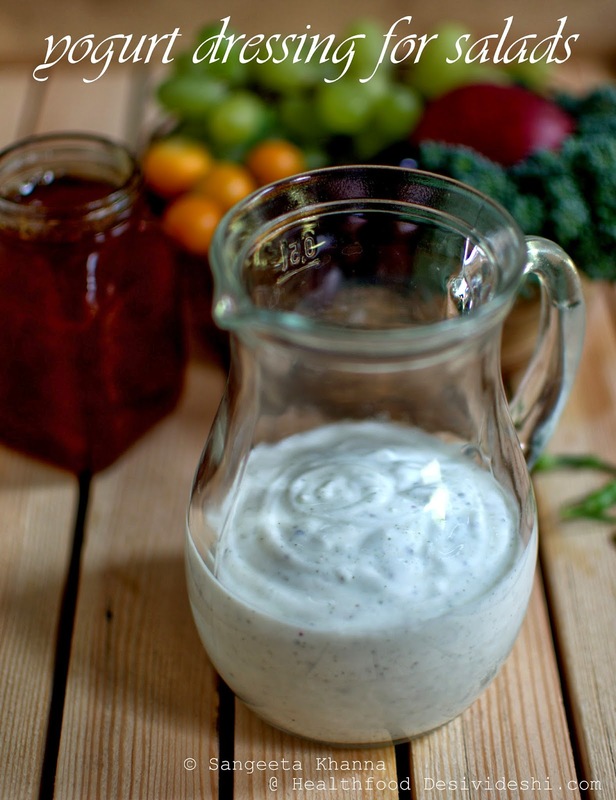 To make this yogurt dressing, just drain the home made yogurt through a muslin lined sieve for a couple of hours till most of the whey is drained and use the thick consistency hung yogurt to make the dressing. You can add any seasoning to make the dressing but if the salad includes some fresh fruits and raw vegetables I like the dressing to have refreshing flavours. 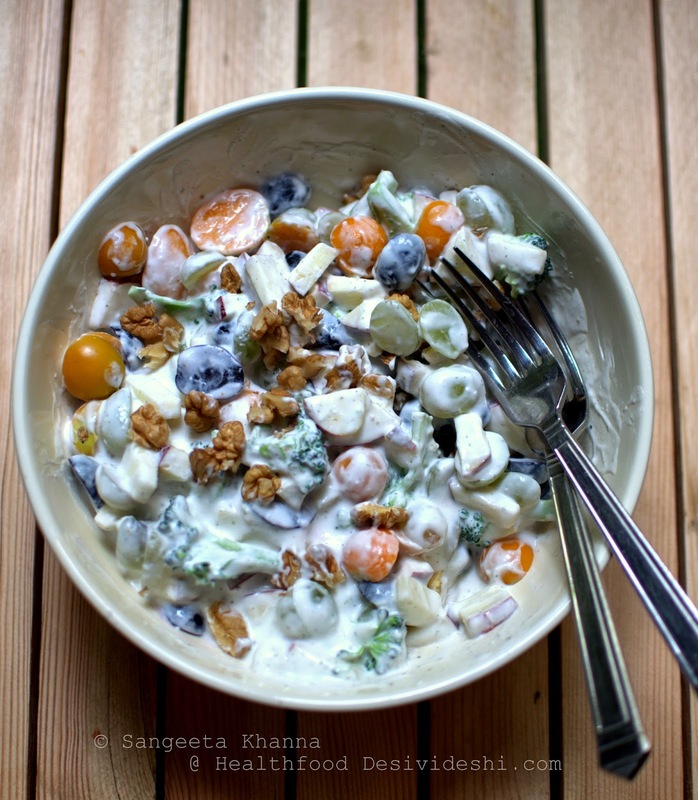 My yogurt dressing for this salad includes a cup of hung yogurt, 1 tsp each of mint powder and orange marmalade, 1/2 tsp each of Himalayan pink salt (sendha namak) and white pepper powder. Whip them all together and the dressing is ready. To make this salad I used a cup of halved cape gooseberries, a cup of halved green and black grapes mix, one large apple diced, a cup of raw broccoli florets, few radish pods (optional) and 1/4 cup of broken walnuts. Just mix all these in the yogurt dressing, fold everything together and serve as required. The salad can be chilled before serving in summers. I have been packing this salad for Arvind's lunch box almost 3-4 times a week now a days and he loves it. The salad is filling, refreshing and yummy. You can adjust the seasoning according to taste, add a little mustard or a bit of paprika, even chilly powder if required and see how it changes your mood. I always choose my seasonings and dressings according to my mood to be honest, it helps a lot in my ways of instinctive eating. The amount of food required to fill me up would remain the same, it is the flavours that bring satiety. If I don't like the flavours, I would never feel sated with my food however large servings I help myself with.